TRANSITIONALS: This velocipede is built to a very high standard. The carving of the metal would have been extremely time-consuming for the metalworker, so this would not have been a cheap machine. It is considered a ‘transitional’ model because the rear wheel is smaller than the first generation of velocipedes. A ‘transitional’ design is therefore part-way between the velocipede and the ordinary (penny farthing). DESIGN: The British bicycle industry was founded in 1869 as a result of the French war with Prussia. Coventry took over as the world centre of velocipede construction. I’m not sure whether this machine is French or English. The manufacturers in both countries built top quality velocipedes: English firms tended to focus on engineering side of the build, with innovations in functionality, while the French makers were known for their flair in design. DUPLEX TUBING: The unqiue design feature of this velocipede is the backbone’s twin frame tubing. This is surely the oldest surviving example of duplex tubing? Duplex frames – side-by-side top tubes – became popular with manufacturers at various times in cycle history, starting in the early 1890s. The ‘Premier Model F’ was the most successful twin frame model marketed in Britain, while the Columbia Light Roadster Safety was the leading example in the USA. The design reappeared on the Moorson Superior Twin Tube in the 1930s. But the best-known bicycle using duplex tubing is the BSA Airborne folding paratrooper bicycle of World War 2. The tubes on this velocipede and its ornate curves set it apart from all other velocipedes of the era. The variety of the machines that were produced in just the few years of its currency (1868-1870) continues to fascinate students of the velocipede. This example is in very good unrestored condition with no apparent damage anywhere and solid metal throughout. 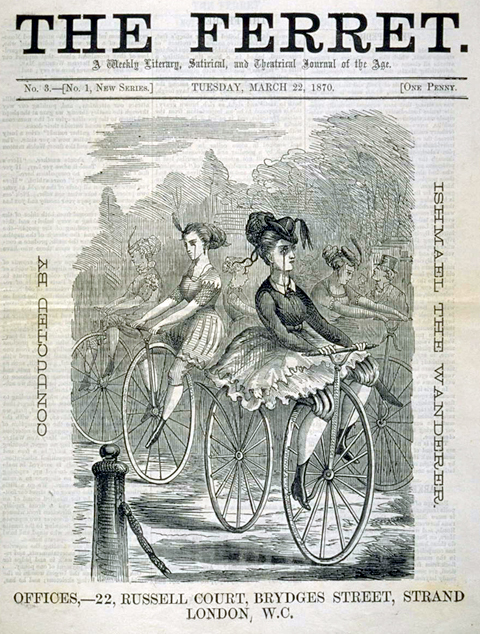 It has been through the hands of some of this country’s leading velocipede enthusiasts. Glynn Stockdale found it in 1980, hanging up in an antique dealer’s showroom without wheels. The wheels were added a year later by Nick Clayton, who has recently written an excellent book on the history of velocipedes. The wheels are in excellent condition. I bought the velocipede some years ago, and took photos of it at Lewes Castle. My friend Phil then took a fancy to it, so I passed it on to him. This week he decided to rationalise his colletion so he sold it back to me.